For many seniors, especially those that need some type of senior care, meal time can be a challenge. For individuals with cognitive or physical challenges, and for those with dementia, meal time can be difficult and overwhelming. 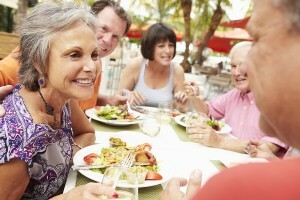 However, this doesn’t mean that these seniors still can’t enjoy quality family meals. Caregivers, friends and loved ones who are providing senior care can take several steps in order to ensure that any family meal they have is a senior-friendly experience and one that helps their loved one feel included and engaged. Pay close attention to the senior’s seat at the table. Is it easy for them to get in and out of? Is it the best place at the table for them to move from if they need to go to the restroom? Make sure that the senior is sitting next to their primary care provider or someone who knows how to provide care. This way they have someone to help them during their meal or assist them in using the restroom. Prepare and cut the food for seniors who may have some physical challenges and who may be unable to use utensils on their own. For seniors who have dementia or other related conditions, dinner table conversations can be a challenge, make sure to plan accordingly and come up with topics that will interest and engage the senior during dinner. It is easy to forget about including them in conversations and can only cause them to feel more isolated. Take the time to make sure there are food items that the senior will enjoy in the meal. Many seniors experience a change in their taste buds as they grow older, and may be very particular about the foods they eat, so preparing a menu they will like is of the utmost importance. Make sure seniors are taking their medications before or after the meal as necessary. Medication management is an important part of quality home care. Attendees should make certain that their loved one is not only taking their medication with their meal, but that they are drinking plenty of water and eating plenty of food with their prescription. Seniors should be drinking plenty of water with their meals. Seniors are at a higher risk of anyone of being dehydrated and dehydration among older adults is a serious issue and can lead to a number of other health complications. There is no better time to make sure that the senior is drinking plenty of water than when they are sitting at a family meal. A family meal can be a great way for seniors to connect with their loved ones. While little tips like this may not seem particularly important, they can go a long way in helping any senior feel more confident and comfortable with any meal that they attend.